If you suffer from back pain, neck pain or headaches or if poor postural fitness is impacting on your ability to live life to the fullest, visit our chiropractors at Karrinyup Wellness Centre and Back Your Inner Athlete. At Karrinyup Wellness Centre we are encouraging our patients and the Perth community to begin a conversation about preventative health and wellbeing and adopt healthy habits. 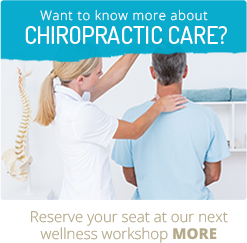 During May Chiropractors from the Karrinyup Wellness Centre will be in the local community conducting health presentations and spinal assessments at gyms and sporting groups. During Spinal Health Week 2016, make an appointment at Karrinyup Wellness Centre for a spinal health check-up and discover what steps you can take to improve your overall health and wellbeing and Back Your Inner Athlete. Contact Karrinyup Wellness Centre on 9341 3020 for an appointment today.